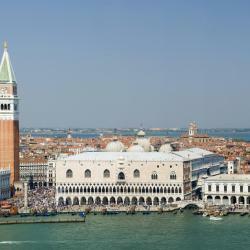 Looking for hotels near Piazza San Marco? Boasting a central location, less than a 5-minute walk from St. Mark's Square in Venice, Residenza Ca' Brighella offers an apartment with free WiFi and air conditioning. Only 328 feet from Piazza San Marco, Morettino is in the center of Venice, at the second floor of a characteristic Venetian building. Located on the 1st floor of a 16th-century building, B&B San Firmino overlooks the Santa Maria Formosa church’s baroque façade and the canal. Hotel A La Commedia is just 215 yards from the Rialto Bridge and the water-bus stop, and only a 10-minute walk from St. Mark's Square. Its terrace features romantic views of Venice. Located 5 minutes' walk from St. Mark's Square, Splendid Venice - Starhotels Collezione is set on a canal in the Mercerie area of Venice. Very efficient staff , that are professional and helpful. Hotel Becher is in the heart of Venice, 55 yards from La Fenice Theatre and a 5 minute walk from Saint Mark's Square. Rooms come with free Wi-Fi and LCD TVs. Staff was friendly and very helpful. Ruzzini Palace Hotel is set in Campo Santa Maria Formosa, one of Venice's largest and oldest squares. This historic building has beautiful décor and is a 10 minute walk from Rialto. Beautiful hotel. The room we had was amazing, the breakfast buffet was great, staff were friendly. Restored to its original splendor, The Gritti Palace is set in a former noble residence on Venice's Grand Canal, with views of Santa Maria delle Salute Church. It was my 10th wedding anniversary, and the hotel upgrading my room to Canal view..
Hotel Rio is in the center of Venice, just 270 yards from Saint Mark’s Square. Free Wi-Fi access is available in all areas. Nice place. Very helpful staff. Great location. 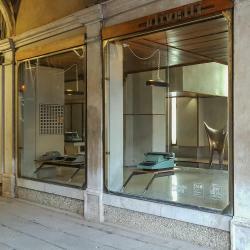 In a 16th-century building only 320 yards from Saint Mark's Square, Hotel Torino is just off of Calle Larga XXII Marzo, the main shopping street in Venice. Stayed here for our honeymoon before joining a cruise ship. The room was beautiful. 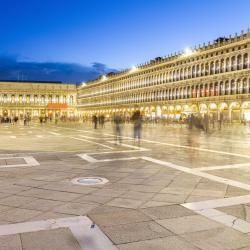 Hotels with great access to Piazza San Marco! In a restored 16th-century building, Le Isole is a boutique hotel offering air-conditioned rooms with satellite TV. The Ducale Palace and St Mark's Square are a 2 minute walk away. the location is excellent, good hotel, good staff , clean, and not expensive. Hotel Al Codega is set in a quiet courtyard, just 5 minutes' walk from St Mark's Square and the Ducal Palace. Rooms are air conditioned and have flat-screen TVs. Beautiful hotel centrally located in a small courtyard away from crowds. Close to St. Marks square. 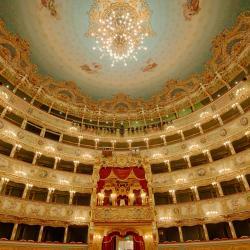 Al Theatro Palace is set in Venice, a few steps from La Fenice Theater. Free WiFi is available throughout the property. This little modern hotel is on a great location in Venice close to Piazza San Marco. Located on the Riva degli Schiavoni, Hotel Londra Palace is just a 5-minute walk from St. Mark's Square. It offers free Wi-Fi, and rooms with antique furniture. Some offer views of St. The location was perfect ...right by San Marco Square! The Hotel Bartolomeo, located just few feet from the Rialto Bridge and 5 minutes far from St. It was very clean and charming! Looked like it had been recently renovated! If you want to dig a little deeper into Agrigento’s impressive history, this is the place to come. The Regional Archaeological Museum is full of ancient artifacts from the area’s Hellenic past – each one supported by a fascinating back story. It’s the perfect complement to visiting the Valley of the Temples. This would be a wonderful urban space to experience if it were not so hugely packed with tourists. If it was so very crowded in late March, it is probably wall-to-wall visitors in the summer, except early in the morning and late at night (possibly). I prefer Piazza Santa Margherita, also very large, but more irregularly shaped (with several large trees plus a few benches), and a bit less crowded, also very popular. 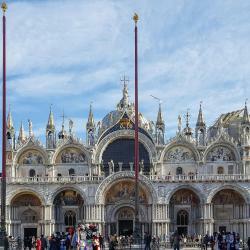 We enjoyed Piazza San Marco as a staging point to begin the never ending exploring of the countless shops there and our visit to St. Marks Basilica. Wear comfortable shoes as the stone streets will wreak havoc on your feet, knees, and legs. Go early to avoid crowd. Be careful in the square area. If you want peigepns included in picture taking, be prepared. They'll charge you 20 euros per person. Bring your own corn kernels if you want to feed them. Avoid following the yellow signs to get there or leaving; take the extra time to meander on the side roads of Venice. It’s a completely different experience! Get up before sunrise and see piazza San Marco as the city awakens. Like all of the other notable spots to see in Venice, you must go early. At 11am it was so overcrowded and really difficult to take everything in. I’d suggest getting up early and going for a walk and getting your morning espresso and enjoying that way. Walk through the middle in the evening, listen to competing cafe bands. Do NOT accept an outstretched rose unless you want to pay for it. We saw many people where a smiling man would approach a lady and hand her a rose, the start to pester her husband for payment. 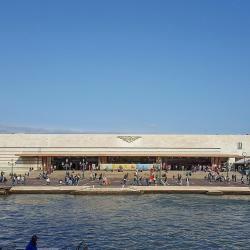 People are talking about Piazza San Marco! Explore guest hotel reviews featuring "Piazza San Marco"
Nice boutique hotel in a quiet location. Room was spacious and clean, and the shower was hot and had nice water pressure. Breakfast (and coffee) was quite good. Staff were very friendly as well. Located about a 15 min walk to Piazza San Marco. Never tired of the view walking over the Ponte dell'Accademia. Reached the hotel via the airport express coach (€15 return) plus a 20 min walk . Had I known the ferry stop at Zattere was close, I would have considered that as a way to get to/from the airport. Great hotel! Upon arriving, our room was upgraded by the nice staff, so we ended up staying in a really huge room, with a big bathroom, plenty of space, top facilities, and a cracking wi-fi connection. 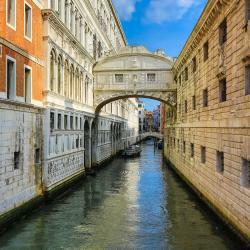 The hotel is a three-minute walk from Piazza San Marco and a five-minute walk from the Rialto Bridge. In between, you can find a lot of shops, bars and restaurants. Definitely, a top choice if you want to discover the charming city that Venice is. Overall, the stay at the Albergo was comfortable and a very good value. Location just off Piazza San Marco was excellent. The staff was friendly and there were extra pillows in the room. Mattress was adequate and bathrooms were roomy and very clean. Overall, a great stay. I didn't eat the breakfast as I dislike hotel breakfasts, but it was a good stay overall. This place was in an excellent location, right near Piazza San Marco. There was a lot of great restaurants and shopping and towards our last day, they had a special going on where you could take a free boat ride to Murano where they make the famous Venetian glass! The breakfast was decent, better than other hotels in Italy. Super easy to find just beside Piazza San Marco. Very near to San Zaccaria water bus stop. Lift was available too. Breakfast was okay (croissants, cold cuts of ham and salami, breads, coffee,juice and tea). Celebrated our anniversary and one of the staff managed to greet us even though it was a busy day at the hotel. The location of the hotel annex was right off of one of the canals. We were able to watch the gondolas go be from our European "1st floor" window. The hotel is between the Rialto Bridge/Grand Canal and Piazza San Marco. There was lots of shopping and great food in the surrounding area. We loved the breakfast! Wonderful fresh fruit was available. We also liked that it was right on a smaller canal and close to Piazza San Marco but not TOO close to all the action. It was also nice to enjoy drinks at the hotel with provided snacks and a quiet, nice atmosphere. nice apartment in a perfect location. it had everything that one needs for a short stay. even though it's right between piazza san marco and realto bridge, it's on a quiet square. when i visit Venice again i hope to stay here! Really amazing location, close walk to everything. Connected with Hotel Monaco, so you check in there. Right at Piazza San Marco, right next to the three San Marco vaporetto stops so very easy to get everywhere.